Polyurethane surface coatings, often referred to as urethane coatings, are high-cost, high-performance coatings that are noted for low-temperature curing, high flexibility, excellent abrasion resistance and good outdoor weathering characteristics. Typical uses for these coatings are on wood furniture; floors; automobiles, aircraft and other vehicles; machinery and equipment; electrical goods; and industrial structures. Urethane coatings have been one of the fastest-growing sectors of the worldwide paint and coatings industry. Despite relatively high cost, their excellent durability, resistance to corrosion and abrasion, pleasing optical properties, and flexibility make urethane coatings suitable for a range of high-performance applications. Urethanes are also finding greater appeal in recent years because of the ability to formulate coatings with lower organic solvent contents. From 1994 through 2006, global consumption of urethane coatings for industrial use increased by about 3.5% per year on average, while consumption of all resins for coatings increased by about 2.3% per year. However, urethanes experienced some decline in 2008–09 as a result of the global downturn, especially in the developed regions, followed by recovery in 2010– 16. From 2007 to 2012, consumption dropped in North America, Western Europe, and Japan, but this was more than offset by growth in China and other developing economies. During 2012–16, global growth averaged almost 6% per year. Certain markets are dominant in the major industrialized regions, including automotive refinishes, wood finishes, and high-performance anticorrosive coatings. The fastest-growing market for urethanes in the 1990s was automotive OEM clear coat finishes, but penetration has slowed in recent years. Urethane clear coats now account for 25% of the topcoat market in Europe and 14% in North America. In Japan, only small amounts of urethane formulations are now used for topcoats. In addition to the high cost of urethanes, environmental and regulatory pressures in Japan have not forced a switch away from the conventional solventborne low-solids acrylics in clear coat applications. Also, in Europe, wood product finishing is much more important than in the United States. In all regions, urethane coatings are used in premium vehicle refinishes. China now accounts for 35% of the global market for urethane coatings. 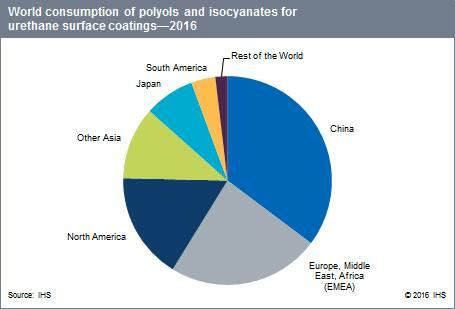 Consumption of urethane surface coatings in China grew at an average annual rate of nearly 12% during 2012–16. Major applications for urethane surface coatings include wood coatings, automobile refinish coatings, plastic coatings (for auto OEM, appliances, and mobile phones), and wire coatings. The fastest-growing application for HDI-based urethane coatings (high UV resistance) has been for automotive refinish applications, because of increasing automobile ownership and much higher accident rates. The aggregate average annual growth rate over the next five years is estimated to slow to 7–8%, and will be driven mainly by automobile refinish coatings, architectural coatings, and plastic coatings. Future consumption growth for urethane coatings will likely be 4–5% per year, while the total coatings market will increase at about 3–4% annually.